Chicken on a beer can? You bet! When Steven Raichlen, America’s barbecue guru, says it’s the best grilled chicken he’s ever tasted, cooks stop and listen. 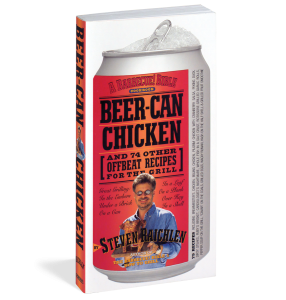 An essential addition to every grill jockey’s library, Beer-Can Chicken presents 75 must-try beer-can variations and other offbeat recipes for the grill. Recipes such as Saigon Chicken with Lacquered Skin and Spicy Peanut Sauce, Root Beer Game Hens, Beer-Can Turkey (uses the 32-ounce Foster’s), Stoned Chicken (it’s grilled under a brick), Dirty Steak, Fish on a Board (Salmon with Brown Sugar Glaze), Mussels Eclade-grilled under pine needles, Grilled Eggs, Wacky Rumaki, Rotisseried Garlic Rolls-even Grilled Yellow Pepper Soup will have your mouth-watering. Whether on a can, on a stick, under a brick, in a leaf, on a plank, or in the embers, each grilling technique is explained in easy-to-follow steps, with recipes that guarantee no matter how crazy the technique, the results are always outstanding. So pop a cold one and have fun.